An entertaining kitchen! This customer was looking for something different, fun and striking to look at. Dinner parties and entertaining friends were an important part of the design along with the use of different colours and textures to create a striking centre piece for this period property in East Sussex. 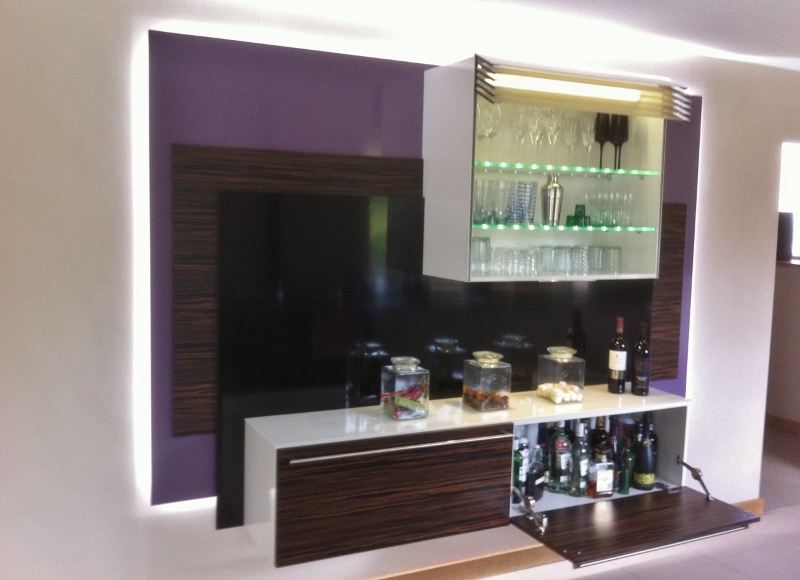 With dinner parties in mind we designed a truly bespoke bar area incorporating an electrically operated glass fronted shutter unit mounted on a mix of high gloss and Macassar Ebony veneered panelling to create a collage effect. 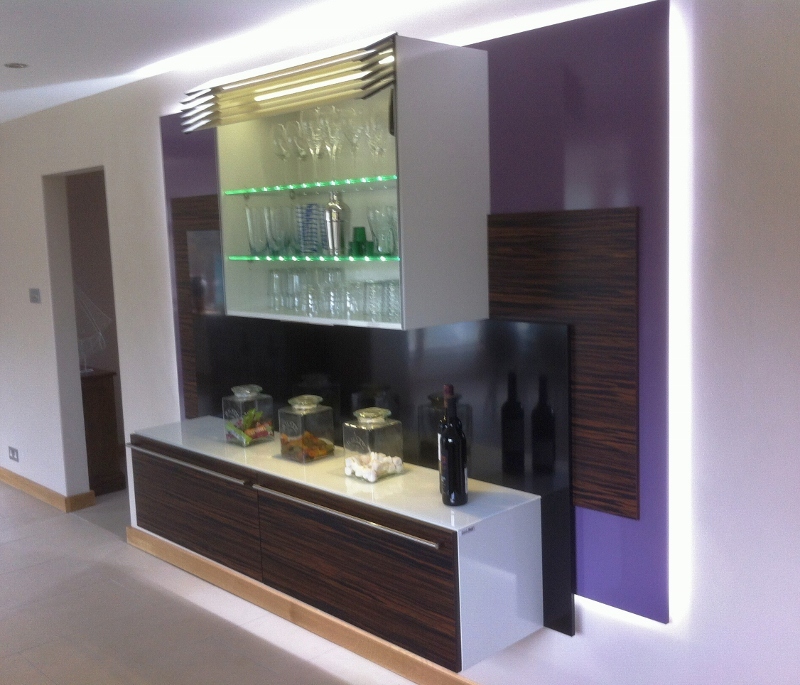 The whole unit was then back lit with high output LEDs to give a floating effect on the wall. A touch-sensitive panel at the base of the wall unit operated the open/close mechanism and also switched on the interior lights. The result is a drinks cabinet which makes mixing the cocktail almost as much fun as drinking it. The main part of the kitchen was finished in rough-sawn planked oak veneer, painted in Antique White with a chunky, solid stainless steel bar handle with oak carcase sides. An AGA provided the main cooking requirements with a Siemens domino induction hob and compact oven/microwave for extra capacity. 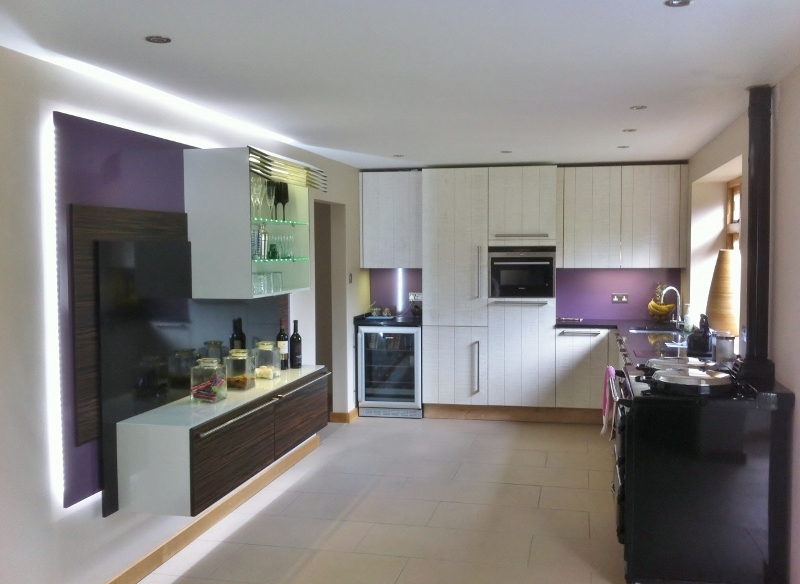 The use of lighting, wood veneers and a touch of Black Rok magic meant that our customer ended up with the ultimate party kitchen, beautiful, tactile and useable, a true one-off, just as she requested.